Test your powers of thinking with over 500 challenging problems and puzzles. "Mensa" presents a collection of problems that require either logical deduction or lateral, imaginative thinking to solve. To help you, the sections are divided so that you know what kind of thinking process is required. 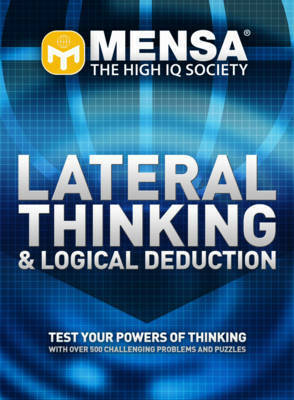 To hinder you, "Mensa" has come up with the most varied collection of problems, puzzles and conundrums you could wish for. Mensa, the international high-IQ organization, is known as a society for people who pride themselves on their ability to solve problems by the relentless application of intelligence. Logic is king in our world, but there are other kinds of problem that cannot be solved by logic alone, problems that require a few moments of consideration before an answer can be found. Dave Chatten and Carolyn Skitt are all Mensa members and highly experienced creators of puzzles and word games for many books that have been published around the world.